On the brownish patch are scattered dark purple spots of variable size, ringed with white, some of which have a central white spot. There is a watery purple band around the mantle edge with some darker patches. Between the brownish patch and the mantle edge are scattered yellow spots which can also be ringed with white. 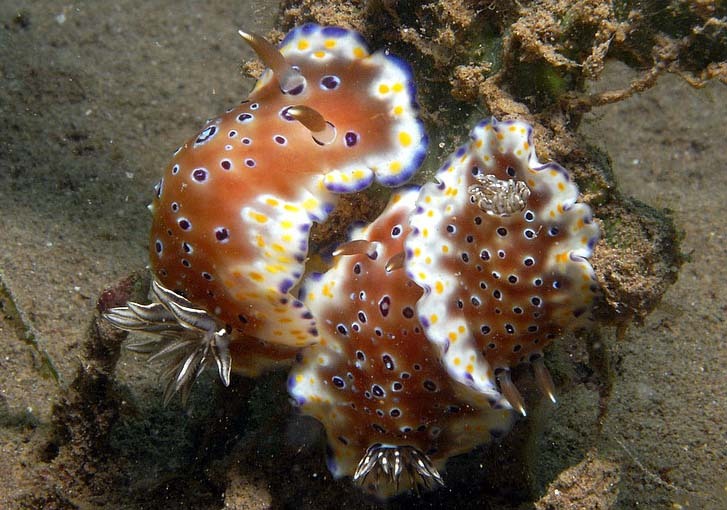 The rhinophores are reddish brown with a white tip and the gills are dark brown, sometimes with white spots. Now, he still believe C. vicina is a synonym of G. tennentanus but that G. cavae is a distinct species. According to Dr. Richard Willan : " I have decided that Goniobranchus tennentanusand Goniobranchus cavae belong to one very variable species. 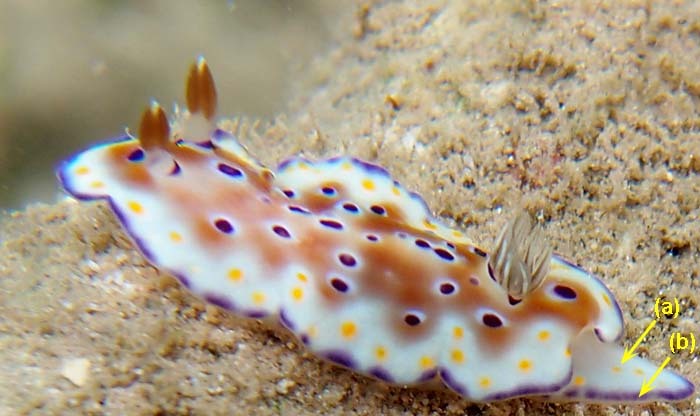 The supposed differences between them suggested by Bill Rudman on his Sea Slug Forum cannot be substantiated when many specimens are studied from many different localities across the Indian Ocean. 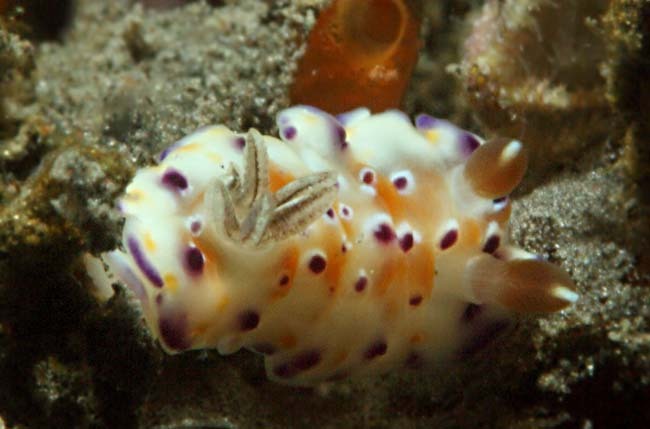 Consequently put them all under Goniobranchus tennentanus on Nudi Pixel with a note that Goniobranchus cavae and Chromodoris vicina are both synonyms "
The typical colour pattern: a central patchy ochre-brown dorsum with ocellated violet spots, a creamy sub-marginal band with yellow orange spots, a blue-violet margin, and ochre rhinophores and gills. 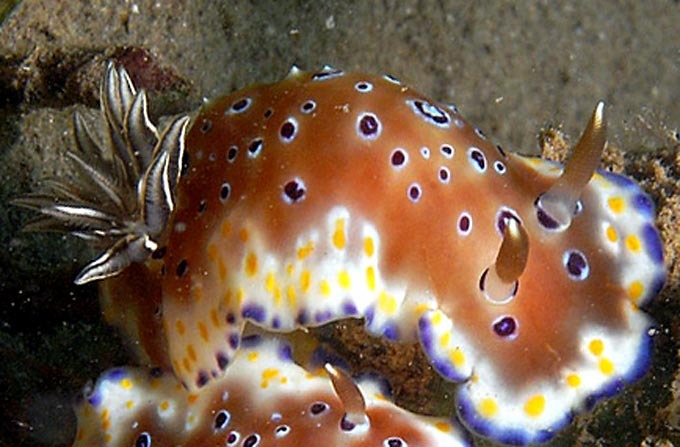 The sides of the body and foot are also creamy white with some large purple spots, ringed with white, on the sides of the body and smaller yellow spots near the edge of the foot. Edmunds, M. (1971) Opisthobranchiate Mollusca from Tanzania (Sub-Order: Doridacea. Zoological Journal of the Linnean Society, 50 : 339-396. Eliot, C.N.E. (1904) On some nudibranchs from East Africa and Zanzibar. Part IV. Proceedings of the Zoological Society of London, (1904) : 380-406. Kelaart, E.F. (1859) On some additional species of nudibranchiate Mollusks from Ceylon. Annals & Magazine of Natural History , IV: 267-270. 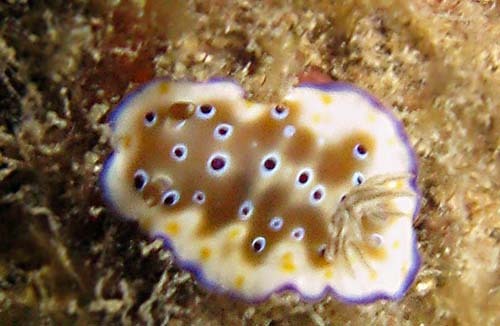 The sides of the body and foot are also creamy white with some large purple spots, ringed with white, on the sides of the body and smaller yellow spots (a) near the edge of the foot.